A wide range of units for filling by volume or weight, with single or multi heads. Suitable for liquids or mixes with fruit or vegetable particles. Special units designed to suit customers requirements. 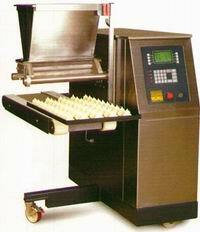 Edhard unit suitable for doughnut jamming or cake icing/filling.